Bonnie Haugen is truly an amazing networker. Among other things she is the Minnesota education coordinator for the Dairy Grazing Apprenticeship and helps in coordinating and promoting a women farmers fall gathering. Bonnie has been at her farm, Haugen’s Springside Farm, near Canton, Minnesota since 1993. In the early farming days she learned to milk when she got her own cows and she had sheep to train her border collies. Bonnie currently has a grass based dairy farm along with other animals. Her son Olaf farms with her and has done all of the dairying for the past five years. Bonnie’s husband, Vance is an extension agent working off the farm. Bonnie does the bookwork for the dairy and her other outside agencies. Interestingly, Bonnie’s daughter, Inga Haugen, was interviewed for and is part of a book, “Time, Soil, and Children, conversations with the second generation of sustainable farm families in MN”. By Beth Waterhouse, 2004. 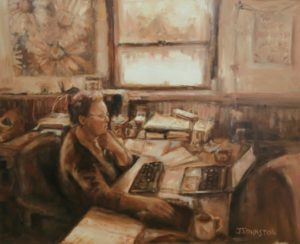 This oil painting in sepia tones shows Bonnie in her office working on her laptop. She was busy connecting women farmers to me for this project!